I’ve struggled with the idea of how to review gin over the years. There’s a lot of subjectivity when it comes down to “what you like” and “what I like.” Though I’ve given numerical rating to every gin as a way of keeping track of what I like, I do my best to explain the flavors in a way that you can make a decision on your own. After all, I like to see the purpose of The GIN is IN as way of trying to help you find a gin that you’re going to love. So that’s why I’ve developed this new method for reviewing gin based on my over two years of writing about gin and even more years of enthusiastically drinking gin. 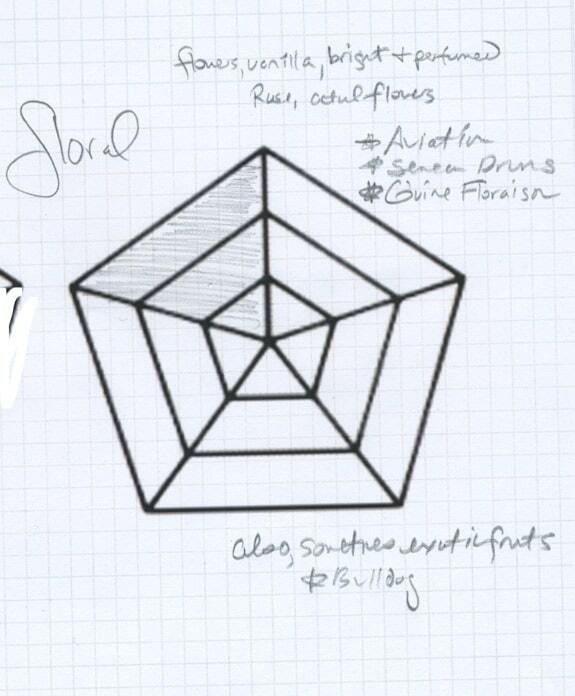 While this system will not replace my 1-5 star rating system, these new pentagonal “flavor” diagrams will appear prominently on every review page. Juniper was intentionally placed at the base of the intensity diagram, as juniper is the basis (both legally, and taste-wide) of gin as a liquor. A gin cannot technically be a gin without some juniper in it. 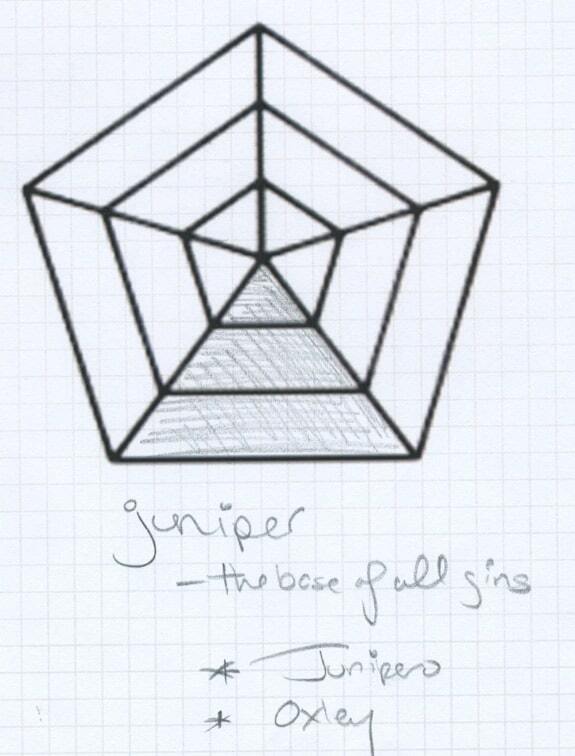 But that being said, the intensity and sensation of the juniper in a gin can fit anywhere within a broad spectrum. Some gins only slightly feature juniper in a “its technically in there so its technically gin, but we know you can’t really taste much of it” sort of way. Fortunately, these are in the vast minority. At the other end of the spectrum you have the extremely strong juniper gins, which include (but are by no means limited to) Juniper and Oxley. Though juniper is the basis of a gin and the basis of this category, other flavors are known to exist in this part of the diagram. Something that gives off notes of pine, spruce or fir may register down here. There are also elements strong green and herbal botanicals which may give off overtones of juniper like spice. But primarily, the juniper zone is about how much this gin fits the classic stereotype of juniper based gins. One thing this does not differentiate though is the softness/hardness of the juniper. For example Schlichte or Steinhager types gins are all juniper, but the juniper is rather soft and creamy. This differs in a large way from Junipero’s strong prickly juniper. Both would score a “3” in this category, but the resulting juniper flavor differs in a rather significant way. This was the hardest section for me to name because I think it is the part of the pentagon that encompasses the widest range of gin flavors. Gins that score strongly in the spicy section often prominently feature classic elements of the gin formula such as Coriander or Cassia, or common but less common botanicals such as Anise or Clove. Spice tries to characterize a broad range of tastes which give a gin a certain warm mouthfeel and earthy depth. Gins that reflect this sort of taste profile most strongly are Berkshire Mountain Distiller’s Ethereal Gin or Death’s Door Gin. Tru2 Gin features a wide array of spices and comes out with a spice flavor. But keep in mind, this chart is not about ingredients. In the kitchen Saffron is most definitely a spice and imparts a certain earthy element, but as far as gin goes I think that Saffron imparts more floral notes to a gin; therefore, you won’t see Gabriel Boudier’s Saffron gin with a huge peak in Earthy. One of the hardest part of creating these narrow categories to characterize such a broad range of flavors is figuring out where the truly exotic and unique elements go. One example that I can safely say would fall in here is the strong Black Peppercorn notes of Bombay Sapphire East. 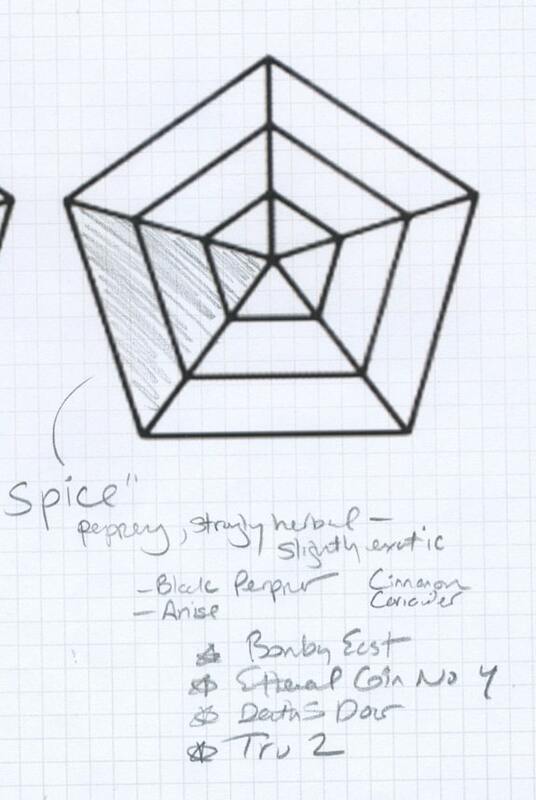 A lot of different botanicals can cause a gin to read as spicy, but they’re all lumped together because I’ve found that the kind of person who likes one brand of particularly spice oriented gin seems very likely to be a fan of other spice oriented gins. Many spices and herbs give off a flowery note. Vanilla and Saffron chiefly, but primarily floral notes reflect bright and sweet notes which are imparted from botanicals which are not part of the historic gin canon (and when I say this I mean: juniper, coriander, cassia, angelica, orris root, and some sort of citrus). Much bold experimentation which often gets labeled “New American” or “New Western” ends up in this part of the graph. Another aspect of gin which often times gives off floral notes is the choice of base. Whereas wheat often has a very neutral scent, gins which have grape bases (G’vine and Seneca Drums for example) read as strongly floral, even if their botanical mix doesn’t contain anything which is obviously floral. The floral section also tends to encompass gins which include prominent exotic fruits. Bulldog gin is one gin which although sticks close to the London Dry profile, it tends to have more hints of floral than a classic London Dry might, due to having longan as a botanical. Another factor that commonly leads to gins which are included in this category is post-distillation infusion. For example Hendrick’s rose notes, which are added via infusion and are therefore quite pronounced compared to the scent of a pure distillate, result in a higher rating in the floral category. This category is also relatively easy to grasp: Lime, Lemon, Orange, Grapefruit. Buddha’s Hand, Pomelo and even Tangerine. A citrus (any citrus, step on up) is part of the standard gin canon, so many gins exhibit some sort of presence in this part of the chart. But some are much more about the citrus than others. 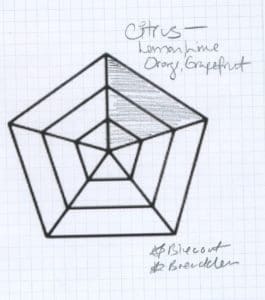 For example two threes I can think of right now are Breucklen (a three for grapefruit) and Bluecoat (a three for orange). But there are many others. I think that next to floral, this is the most widely expanding part of the gin market. Citrus is in nearly all top notch gins, but rarely until recently have distillers allowed citrus to steal the show. There aren’t many other botanicals which could lead to high readings in the citrus category. I could see other strong, acidic fruits like Pomegranate giving off citrus-like notes, but up until this point I have not tasted a gin where the Pomegranate was so up front and center that the gin suddenly warranted inclusion in the “heavy on citrus” class of gins. Yes, not a traditional flavor. So heat is that burn that gin has. Sometimes people attribute it to juniper alone, but I know that’s not the case. 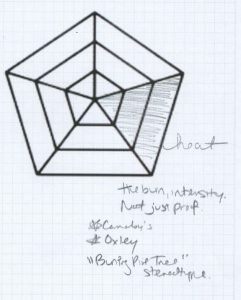 Aaron’s Note: Here is where I’m going to talk a bit about the subtle difference [again] between hard and soft juniper. Humor me…. As I mentioned above, Schlichte would score a three for juniper but it hardly has the same mouthfeel as another heavy juniper gin like Oxley. This is where heat comes into play. Schlichte is a soft juniper, which feels smoother (and as I’ve previously described in other reviews) and flat. 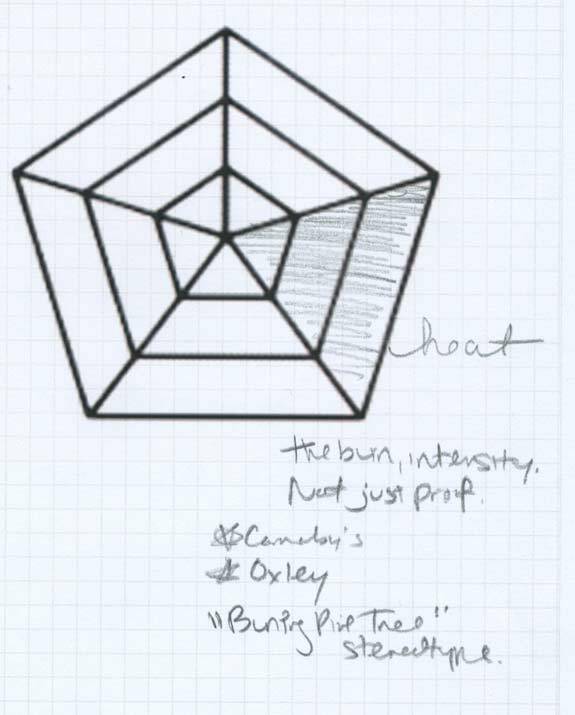 Oxley is pert, spiky (one of my key words for a harder juniper flavor) and definitely hot. But Heat isn’t only about Proof. Yes, many overproof (>40%) gins taste hot. You’ll see many of them score very highly in this category. Its not just about proof. For example some 40% gins taste very hot. Carnaby’s is one example. Heat is a bit about that alcohol burn. Does it smell really full of alcohol when you open the bottle? Does it burn harshly when you sip it neat? Is it going to really stand out strong in a cocktail? These are some of the things that go into determining the heat of a gin. and you have a new way of looking at gin. Once you know what you personally like, my reviews will help you from a quick glance see which gins may be up your alley. And which gins you might want to try a cocktail at a bar instead of buying the full 750mL for yourself. Stay tuned, this weekend I’ll be rolling out intensity maps for every gin I’ve ever reviewed. The next week, we’ll have a few new full bottle reviews for your gin drinking pleasure. Thanks for reading the Gin is In! I’d love to hear what you think about this new review system: good and bad! Please feel free to comment. I look forward to hearing what you think! Looks like a great system to me. It’s obviously going to be a bit subjective, but then what review system isn’t? Subjectivity is hard to escape completely, but at least this will try and reduce the important of that final number rating. After all, if you like Floral & Juniper gin but I gave it 1 star, you might want to try it anyway. But thanks, I hope it does turn out to be a great system in the end! Your pentagon system is incredible! Many thanks! Now if you could please come up with one for Scotch.